Doing my best to facilitate kindness, give a positive atmosphere for learning and sharing art and trying to boost the good humans we interact with by helping others find a a brighter day or at least distraction or a comfortable place to be. Finding ways to have more fun and rewards during the stream, games prizes for subscribers etc. Patreon works psychologically as a self confidence and Stability system , Much like subscribers on twitch! The stable monthly income coming in from somewhere can help INCREDIBLY with everything from ordering and planning materials and payments to just being able to smile a little more because someone believes in you. I send out All my wallpapers I have made to everyone Bi-Monthly on the $30+ tier. 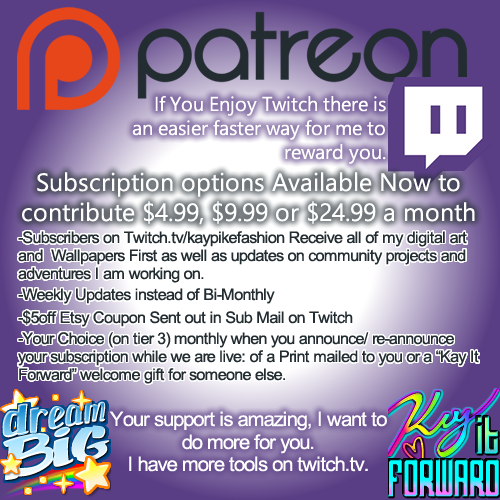 Subscribing on https://www.twitch.tv/kaypikefashion http://bit.ly/Subscribe_toKay is wonderful for the whole channel. And a place in my heart. And in the hearts of those that Like my paintings and live-streams. This covers one complete paint. This is available for those that wish to quietly help their little painter succeed.